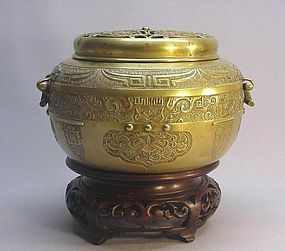 This cast bronze incense burner is an early 20th century product. 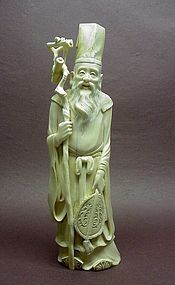 It is 6 ½” high (with carved hardwood base is 9 ¾” high) and 9 ¼” in diameter. Two bands of archaistic designs surround the upper half of the body. The lower half contains four floral designs which are repeated in relief on the cover of the vessel. It is in great condition. 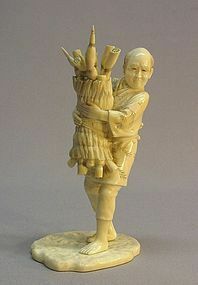 This carved antler netsuke of a young boy holding a puppy is a late 19th century product. It is 2" high, 1 1/8" wide and a little less than 1" thick. 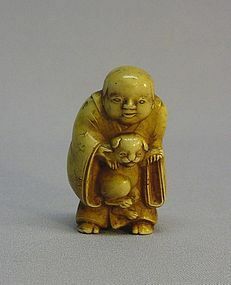 The contrast of the smiling boy and the less than happy puppy provides a great over all impression for the piece. It is not signed. It is in great condition. 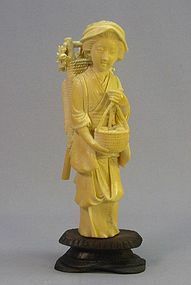 This small ivory carving of a geisha is a late Meiji period (1868~1911) product. It is 3 1/8" high, 1 1/4" wide and a little less than 1" thick. 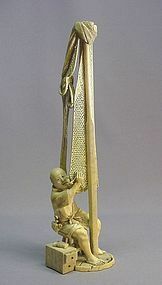 It depicts a geisha bowing her head demurely and looking at the floor. 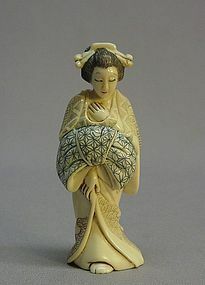 Her right hand holds her kimono robe closed; her left hand rests on her chest. The artist signature is on the bottom. It is in great condition. This Japanese ceremonial Tenmoku style chawan (tea bowl) is a late Meiji period product. 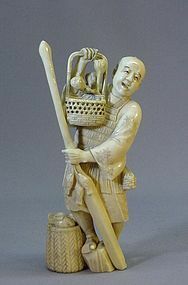 It is 5 ½” in diameter at the top, the foot is 1 ½” in diameter and 2” high. It has a very dark brown with white textured spots on the exterior. 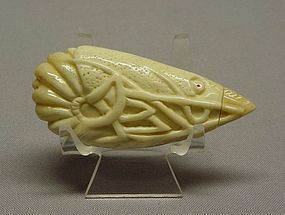 The base is not glazed and there is a swirl mark in the center. 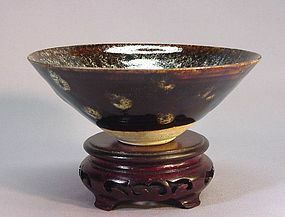 The interior of the chawan is richly colored black, dark brown, light brown and grayish blue. It is in excellent condition. 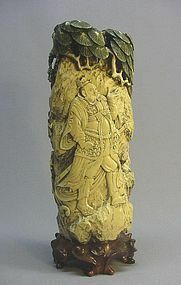 This very well made and hand painted vase is a 19th century product. 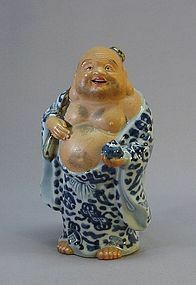 It is 9 ½” high and 2 ¾” wide from the widest part. 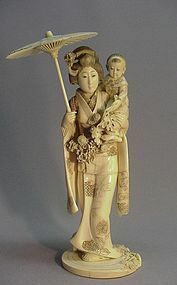 It depicts chrysanthemum and butterflies over a beige crackled body. 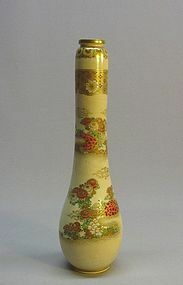 There is a brocade pattern design on the top of the vase. 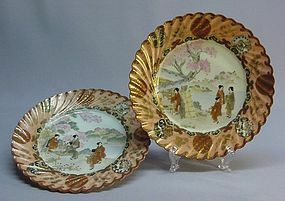 The black hand-painted mark “Dai Nippon, Taizan Sei” is on the bottom. It is in great condition. 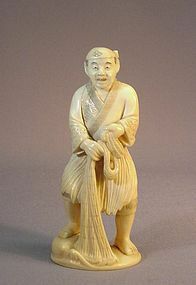 This late Meiji white molded ceramic netsuke is 1 5/8” long, 1” high and 1 ¼” wide. 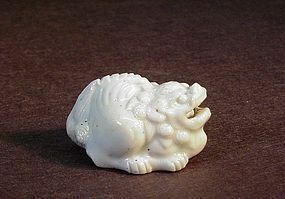 It depicts a reclining Shi Shi (lion) with its mouth wide open and a loose ball inside. 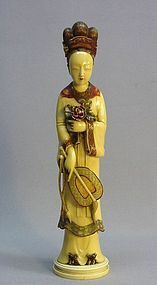 Aside from some tiny black spots due to the firing, it is in very good condition.